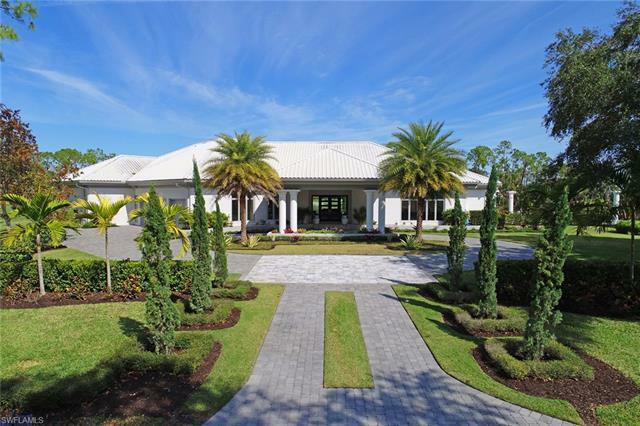 4587 Oak Leaf Dr, Naples, FL.| MLS# 219009470 | Bonita Springs, Estero, Naples, Fort Myers Beach FL Real Estate | Marie Pimm PA Realtor. Representing U.S. and International Buyers and Sellers in the purchase and sale of investment or personal property. Marie is a skilled 1031 Exchange Realtor. Exquisitely Reimagined! At the end of this private street sits an iconic estate home that is truly a masterpiece. This modern day marvel offers the a merging of technology with a seamless succession of outstanding design and architecture on a true unicorn lot. With soaring ceilings and walls of glass, this residence shows off its prized views and envelopes the panoramic greens, mature trees and towering palms. Truly an unrivaled feature is the expansive chef's kitchen offering quartz countertops, a custom wine center and commercial grade appliances. The master retreat is a sophisticated, tranquil escape with a true spa bath and private screened garden allowing for the utmost in dream settings!